Acoustic Flow Monitor | MERRICK Industries, Inc. 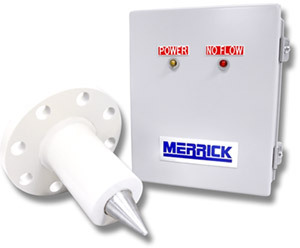 The MERRICK Acoustic Flow Monitor was developed to provide a reliable method of detecting material flow or flow interruption in pipes or downspouts. Unlike other instruments that detect only the presence or absence of material at a certain point in a pipe, the MERRICK Acoustic Flow Monitor detects the actual flow of the material. It can therefore alert the user to a pluggage above, below or anywhere in the pipe. It is particularly suited installations where, due to licensing or administrative restraints, nuclear type detectors are impractical. When mounted above a feed system, the detector can provide a reliable alarm signal in the event that a flow stoppage occurs. As material flows through the downspout, sonic waves are generated at the friction interface between the material and downspout wall, material and sensor probe, and material particles moving against one another. This sound vibration is transmitted as a physical motion through the tip of the sensor probe. This motion is converted by a piezoelectric element to an electrical signal, which is amplified and forwarded to the control unit. Within the control unit, the signal is further amplified and filtered to eliminate non-flow related interference. The incoming signal activates and maintains a “material motion” status. In the event of an empty downspout or one full or partially loaded with non-moving material, the “material motion” signal drops below a set point, providing a contact closure which shows flow stoppage has occurred. An adjustable 5 to 60 second time delay is included in the circuit to prevent nuisance alarms caused by transient conditions.